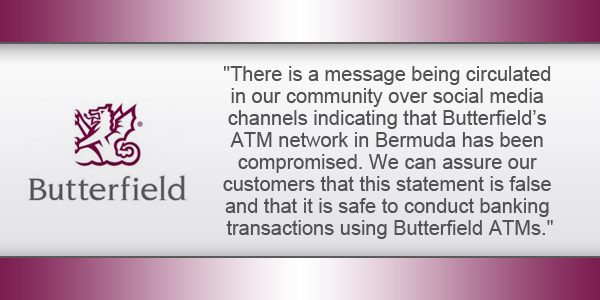 A Bank spokesperson said, “There is a message being circulated in our community over social media channels indicating that Butterfield’s ATM network in Bermuda has been compromised. “We can assure our customers that this statement is false and that it is safe to conduct banking transactions using Butterfield ATMs. “We would like to take this opportunity to remind our customers that they should never divulge their Personal Identification Numbers [PINs] used for ATM banking or debit card transactions to anyone. “In addition, PINs should be memorised rather than written down, and certainly never written down and kept in close proximity to their cards. “Further, we remind customers that Butterfield personnel will never ask them for their PINs or their passwords for online banking, and the Bank will never contact customers requesting that they visit a website to ‘update’ or ‘unlock’ their online banking credentials. Still waiting for my paperwork that can only come to by Email to fill out so I can hopefully get my hard earned money back guess I have to wait the full 10 days to get the paperwork and hope a new card is available next week as promised. Hope BNTB does some serious investigation on this. Sadly no one seems to care anymore, not our problem. Ditto your comment. A family member was hit after using ATM machine at Maximart….account emptied. Explain that BNTB. To add insult to injury, the bank said it would take 3 to 5 working days before they would send fraud form. So how long after that before getting money back??? I also know a banking officer working for BNTB who had their credit card compromised. The bank needs to invest in the new microchip cards that they have been using in Europe for years! They have been promising customers that they are coming but are still lacking this service for their customers. In the meantime, if they are happy to pay fraud claims, that is fine but wouldn’t it be less expensive for the bank to invest in these new microchip cards for their customers?